Glendale (heinnews) – The 2017 NCAA title game is not just a showdown between North Carolina and Gonzaga, it’s also a match-up of two teammates from the 2012 FIBA U17 Basketball World Cup winners. Point guard Joel Berry II has the North Carolina Tar Heels back in the NCAA championship game for the second straight year – looking for the illustrious school’s fifth NCAA title. At the same time, power forward Johnathan Williams is a leader for the Gonzaga Bulldogs who have lost just one game all season and are making their debut in the finale. But the senior Berry and the junior Williams will be looking for another title as they are already U17 world champions. 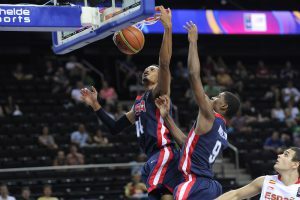 Berry was the starting point on the USA team that cruised through the field in undefeated fashion in 2012, going 8-0 with an average winning margin of 39.9 points. “That was one of the best experiences I’ve had in my life,” Berry said looking back on the tournament in Kaunas, Lithuania. It’s not a surprise that the closest game was the Americans’ first game – a 22-point win over Australia, a team that featured Dante Exum and also had Ben Simmons. But the USA won the Kaunas final against those same Australians by 33 points. Berry averaged 7.9 points, 3.2 rebounds, 2.9 assists and 1.9 steals as the starting point guard on a team that had current NBA playmaker Tyus Jones coming off the bench. The loaded USA team also included current NBA players Justise Winslow, Jabari Parker, Stanley Johnson and Jahlil Okafor as well as Dakari Johnson from the D-League. The Gonzaga power forward Williams averaged 7.0 points and 4.6 rebounds in the U17 tournament in 2012. The battle on Monday night at the University of Phoenix Stadium will actually be the first collegiate showdown between Berry and Williams – the latter who played two years at Missouri before sitting out last season as a transfer upon his move to Gonzaga. And Berry said it will be fun to go up against his former USA Basketball teammate. “We had guys on that team that were pretty good. I mean, some of them I can’t play against right now because they’re already in the NBA. But just to be able to go up against him is just great,” Berry said. Williams will know the UNC team actually quite well as he was former teammates with Tar Heels Theo Pinson and Justin Jackson as well. The three of them won the title at the FIBA U16 Americas Championship 2011 – the tournament which served as the qualifier for the FIBA U17 Basketball World Cup the following summer. Berry was not on the U16 team and Jackson and Pinson did not make the USA team for the U17 spectacle. All four will be on the court together again … with Berry and Williams fighting it out to become the fourth player from that 2012 U17 team to win an NCAA title after Jones, Winslow and Okafor, who won the 2015 crown as a freshmen trio with Duke.